Secret Saucer are a collective of musicians whose origins are rooted in the Strange Daze Space Rock festivals which were held first in western New York and then Ohio from 1997-2001. Their membership has at various times included members of Quarkspace, Architectural Metaphor, Star Nation, Sun Machine and others. Last year’s Nachvollziehens album compiled remixed tracks from earlier albums, live in the studio tracks, and a previously unreleased song, and now Phase Five offers up the first brand new set of Secret Saucer music since 2011’s Four On The Floor. 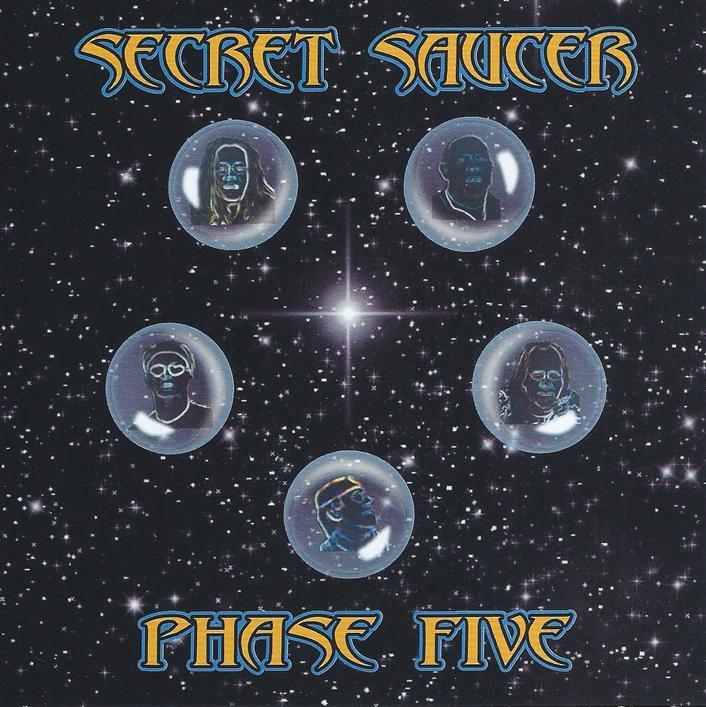 Secret Saucer have come a long way since the improvisational jams that characterized their first albums, and some of the music on Phase Five took me by surprise. There’s a lot of variety here. After the electro-tribal introductory Blue Star the band blast off with Spin Drift, a good time Space Rock ‘n’ Roller that reminds me of Alan Davey’s Chaos Delight album which paid tribute to sci-fi soundtracks and TV themes. The punchy fuzzed out bass certainly conjures up Alan, the keys scream 60s sci-fi, and it’s got a tasty catchy melody. Great tune. Visible Light starts off sounding like Hawkwind at their most electro-grooving, with guest Tom Brehm contributing some cool fiddle parts. But then the music does a 360 and transitions to a spacey melodic keyboard dominated Prog theme, and later Brehm joins in with some soaring fiddle licks and the freaky synths bring us to an extra-terrestrial finale. The band rock out again on The Alderson Point, which zig zags from intricate instrumental gymnastics that remind me of the Prog band IQ, to heavy rocking Hawkwind, and has some killer guitar from guest John Pack of Spaceseed. This is probably the most compositionally complex song I’ve ever heard from Secret Saucer. We shift to Space-Doom mode for Three Days of Darkness, which is an onslaught of alien effects and ripping guitar leads from guest Steve Bemand, all occurring amidst an aura of stoned cosmic doom. Imagine lava pouring out of a black hole and sludgily oozing through your cranium. Secret Saucer shift gears yet again for the quirkily Motorik yet heavenly Space-Prog vibe of The Quencher, which also has a bit of a Hawkwind D-Rider feel. This bleeds seamlessly into Space Walking, which is dreamy and flowing but with a steady rhythmic pulse and a cool combination of Proggy keyboard melody and spaced out synths. Mr. Natural is an intense sound effects and electro rhythms exploration that reminds me of parts from Hawkwind’s Palace Springs. Then past the halfway mark the music transitions to a jazzy, drifting yet grooving theme with pleasant flute solos from guest Greg Klucher. And the set concludes on a heavy note with Nova Star, a stoned Space Rock dirge with another mighty guitar lead from Steve Bemand. Well… hot damn! After several spins this past week I have to say that Secret Saucer have outdone themselves with this one. Great compositions, awesome playing from everyone and lots of fun and interesting variety throughout. Recommended!